Time to head home--feeling well! 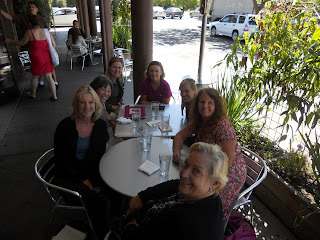 The last few days before I went to surgery I was able to visit with family and friends. On the first of September, Dr. Dale Erickson, our first doctor at Chidamoyo in 1968 came up to have lunch with Sylvia and I. He was in San Francisco at a medical conference and drove up to spend the afternoon with us. He is a nephrologist in Albuquerque now and it was great to see him. On the 3rd-5th of September, Sylvia and I went with my brother Dennis and his wife Kathy to Reno to visit my older sister Carol and her husband Mike. We had a wonderful visit and the penny slots kept us busy and got some shopping in! From the tables to the table! 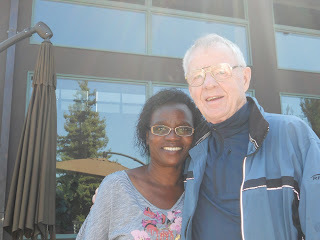 My friend Sylvia who is Zimbabwean and a nurse in a local hospital here in Santa Rosa, California, and I have been spending our time visiting local doctors. They did ruled out TB and the scans show my liver has enlarged over time. After consultation with doctors and a surgeon I am scheduled to have my gallbladder removed (it is non-functioning) and a liver biopsy on Wednesday (Sept. 5th) of this next week. On Monday Sylvia and my brother Dennis and sister-in-law Kathy and I are driving to Reno, Nevada to spend 2 days visiting with my older sister Carol and her husband Mike. We will stay at the Atlantis Casino and enjoy some penny slots, good buffets and visits with the family.